First....and uh.....because I'm first I.........uh....talk about mega man...I think? Well anyway that's pretty cool. I wonder what would people think if a Maverick Hunter figure was made based off of the cancelled game? Oh my gosh. He looks ugly. PASS! American companies can't do Mega Man figures, they always get something wrong. Even other countries screw him & X up like F4F which I believe the HQ is in Hong Kong. 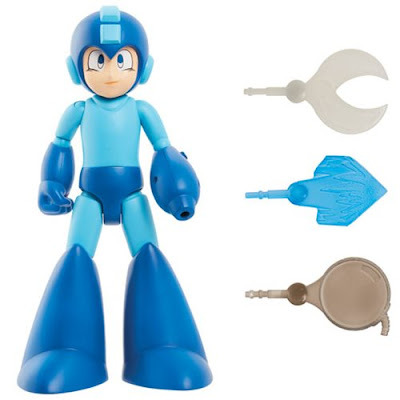 I think the deluxe Mega Man's right arm looks a bit small to be honest. Aside from that I think the toy looks fine! "Mega Man has never looked better! ".....I beg to differ. This look so cheap! For $40 you can just buy the 4inch sentinel figure, even if its for a child you can do so much better. 39,99 USD for this figure is very expensive. I payed 34 USD for the Megaman 4 Inchnel Version in the Retail Stores. But well, at least this megaman looks much better than other megaman created by USA makers xD. Would have been something.... If nel wasn't here. It doesn't look "that" bad, to be fair. I don't think I am gonna get one. Some of them are okay, but Jazwares has a huge quality control issue. Jazwares had a quality control department? I wouldn't be surprised if they didn't have one, to be honest. "Critique", also known as, derogatory talk of perfectly fine merch. The large Mega's arms could be a little bigger, I'll admit, but otherwise they got his look down. While I'm all for more product being available, if you're going to charge premium price, it has to look the part. This looks awful, and the rest of the stuff shown isn't fairing much better. It looks even *worse* when you compare it to the other figurines available from just the past two years or so. What's awful about it? The only thing that isn't outstanding are the weapon attachments. They're very basic. But this looks like, well, it's Classic Mega Man. With slightly off proportions. What's the big deal here? I think it's awesome we'll be getting mainstream Mega Man figures again, aka, found common in most stores. And for that, it looks great! Will probably be a bit less than $40 too. No offense to the company but that is very far from the best looking Megaman figure, the Bandai figures are leagues better. I'm going to be honest, it looks like the Sentinel Mega Man but on a very small budget. I could care less about this though, bring back Retro Roto! I need my Wood Man! Hi Brian, did you get my messages from a few weeks ago? That… I… wow. Those "8-bit" "figures" look like burnt trash. I'm not usually so blunt, but seriously. They're absolutely horrible! And, those are officially-licensed? That's inexcusable.